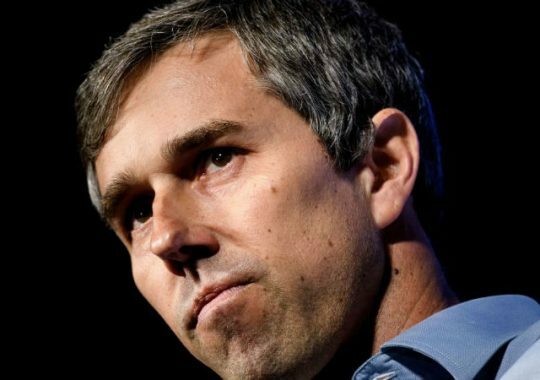 Former congressman and presidential candidate Robert Francis O'Rourke extolled the "record security and safety" at the U.S.-Mexico border during an interview with former Obama adviser David Axelrod on Sunday, despite the fact that thousands of individuals are arriving at the border every day. "Just know this, our current president will stop at nothing to maintain or accrue more power: asking the government of Russia to produce Hillary Clinton's emails as a candidate, or on election day in El Paso, Texas, which had had the greatest turnout in the entire state of Texas in 2018, calling for border patrol crowd control exercises in a community that's 83 percent Mexican-American," O'Rourke said. "Or on the day that we announce having a number of asylum seekers detained behind cyclone fencing and barbed wire, all of whom disappeared the next day, or sending 5,500 U.S. service members while at war half a world away to the U.S.-Mexico border at a time of record security and safety. It's not just his rhetoric, it's the caging of children, it's the practices and the policies, and things he's trying to do to undermine our democracy and country," O'Rourke continued. In March, over 100,000 migrants were turned away or apprehended at the southern border, an increase of over 100 percent from the same time last year, according to one report. Rodolfo Karisch, the Rio Grande Valley Sector Chief Patrol Agent, said the Rio Grande Valley sector is "receiving caravan-equivalent numbers every seven days." Former Obama DHS Secretary Jeh Johnson said the influx of immigrant caravans at the Mexico border was "a crisis by any measure." "This is, in my view, having owned this problem for three years, first, I know what a thousand a day looks like. I saw it myself at border patrol holding stations," Johnson said. "I cannot begin to imagine what 4,000 a day looks like. It must overwhelm the system." This entry was posted in Politics and tagged Beto O'Rourke, DHS, Illegal Immigration, Jeh Johnson. Bookmark the permalink.